I love cats as much as I love the Underground, cups of tea, Carry On films and other things of varying shades of embarrassment. But I’m forever disappointed at how badly cats, specifically those who make their home in a particular location, get immortalised for posterity. Contextualised felines fare especially badly in popular music. Stray cats don’t count. I’m referring to ones who make a specific place their stamping, or rather padding, ground. I can’t find a trace of any song called Station Cat*, the creature doesn’t turn up in the schoolyards remembered by Cat Stevens or Paul Simon, while Farmyard Cat by Prefab Sprout is easily the worst song Paddy McAloon has ever written. Thankfully there’s at least one cat whose legacy lives on in words, if not in music. 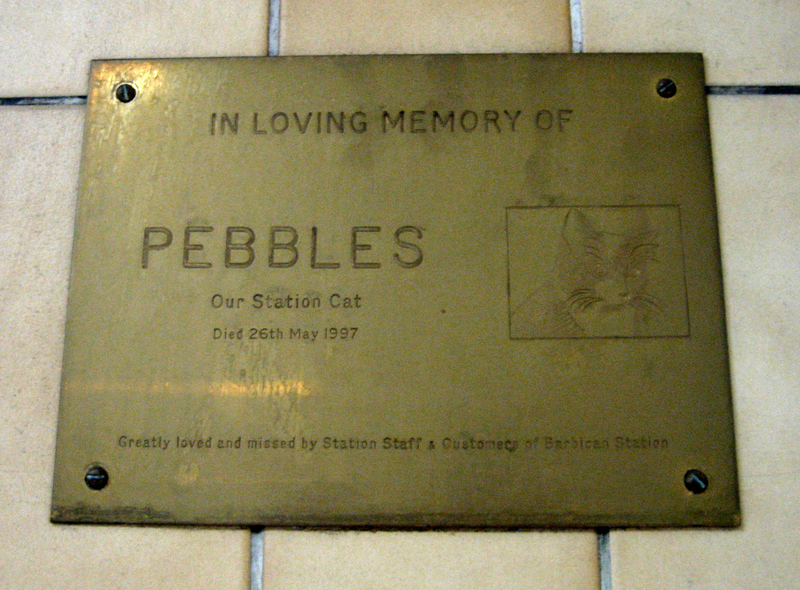 Pebbles gets a touching tribute at Barbican station, whose platform nooks and walkway crannies he made his home for many years until his death in 1997. For part of his life Pebbles had a cohort called Barbie, with whom he apparently shared the run of the station, but about whom no mention is made on the memorial plaque. Both cats were due to appear at a ceremony in 1997, where Pebbles was to have been given some sort of lifetime achievement award before being photographed with Patrick Moore and a gaggle of GMTV presenters. At least death spared him, and us, this indignity. Instead he remains, to this day, “greatly loved and missed by station staff and customers.” Even by those, like me, who never met him. *Once I’ve finished all 150 entries, I might remedy this. Does ‘Skimbleshanks the Railway Cat’, from the musical ‘Cats’, count? Hmm. Not quite, I think. The criteria has to be standalong songs, rather than part of a longer score. I remember Pebbles. Very good at taking the tickets at the barrier – stopped them from blowing away by sitting on them. Didn’t care for having his zen concentration disturbed by patting. I love station cats. It’s one of those tiny things that all stations should have. At least Pebbles wasn’t stuffed and put on display in a glass case, forever. Like Jim, the Slough station dog.